2010 has been a productive year for most of the creatures in and around our yard, despite unusually deep and lengthy snow cover last winter and unusually prolonged heat and drought this summer. The barn swallow colony had great success, even including the late summer nestings. A pair of phoebes once again shared the swallow room with the horde of swallows. This year they built their nest on a board nailed between two joists just inside the swallow entrance, seeming to not be bothered by the constant swallow air traffic inches below their nest. The phoebes nest earlier than the swallows, and, perhaps, didn't anticipate the madhouse that was to follow. 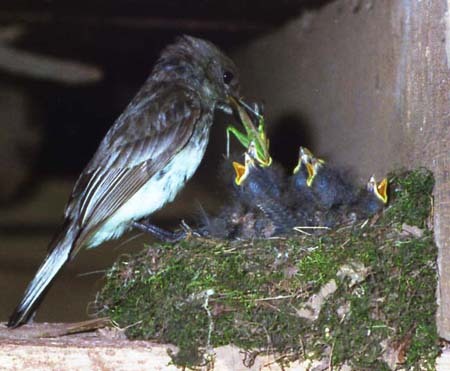 Their nesting was monitored by video and the incubating and brooding phoebe showed no interest in the swallow activity. Flicker vs Starling - The battle continues. Our main project this year was to monitor several flicker boxes mounted on the barn wall and trap any starlings trying to use these boxes. 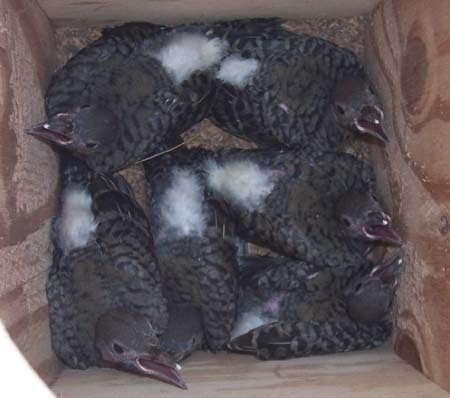 Monitoring actually started in 2009 and intense starling competition with the male flicker continued throughout the off season. What began as a routine chore of the home habitat turned into a video adventure full of surprises. And, the flickers nested successfully this year, thanks to continual video monitoring of three boxes and removal of many pairs of starlings, as well as great resourcefulness on the part of the flickers. For the first time, after 20 years of hosting a pair of kestrels in various nest boxes, and for the last 9 years, in the kestrel tower in our front yard, a second pair moved into one of the flicker boxes on the barn wall. The flickers had already given up on this box after many starling pairs had evicted them, even though I quickly removed the new starlings. Instead, the flickers excavated an opening around the corner in the barn wall. Both the tower kestrels and this second pair of barn kestrels fledged 4 young. They had divided up their hunting territories quite nicely and I never observed any conflicts. We'll see what happens this winter. Normally the tower kestrels spend a great deal of time near the barn in winter. 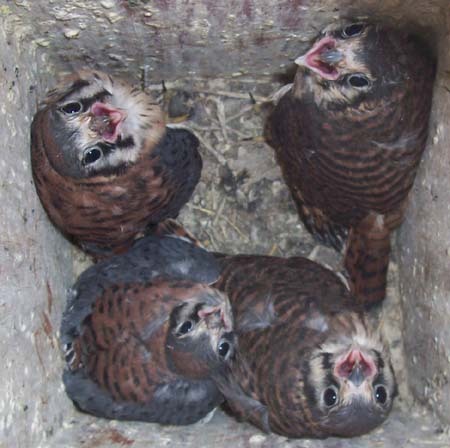 Following the fascinating polygamous nesting of 2006, the trio returned in 2007, with the females roosting in the nest box and the male usually roosting in the silo. However, before the first egg was laid, one of the females was found nearby, at the edge of a cedar grove, with one wing severed and dangling from the body only by a small flap of skin. The remaining pair continued to use the nest box, but one of them also disappeared before egg laying began. Diane had seen a dead owl on the road half a mile from home that day. The nest box was deserted for the rest of the year. 2008 faired no better for the barn owls, but did prove of interest. A pair of owls first roosted in the nest box on March 30, and displayed normal nesting behavior until June 10. During that time, 6 eggs were laid and 3 had hatched. On the evening of June 10, all three nestlings and two of the three eggs had vanished. The female continued to incubate the single egg and the male was observed to bring her a vole. The two engaged in much beak rubbing and eventually mated - then more beak rubbing. Later, the male was observed kicking in the litter extensively. He picked up something and carried it in his beak to the entrance, apparantly to pitch it out. The entrance isn't in camera view. Later, he left and returned with another vole for the female, leading to more beak rubbing and mating. 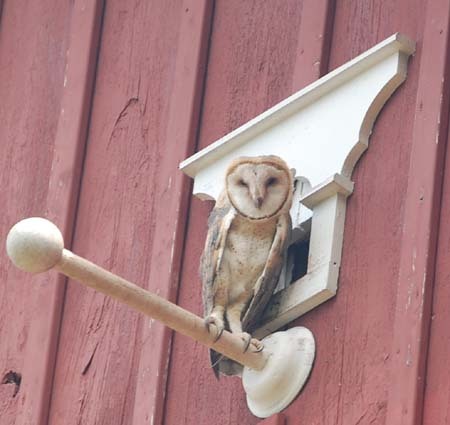 For the remainder of June, the two owls visited the nest box at night, but roosted in the silo. I believe the male who appears to have destroyed the nestlings and eggs on June 10 was a replacement who stepped in immediately following the demise of the first male. Evolution doesn't reward an individual for working to pass on someone else's genes. Even our barn swallow males sometimes destroy nestlings or eggs of another pair so they can mate with the female. 2009 was a more normal year for the owls. The female began roosting in the nest box on Feb 20, and the male roosting in the silo. Beginning March 11, both owls roosted in the nest box. The first egg was laid on April 11. 6 eggs were laid and 4 nestlings fledged. 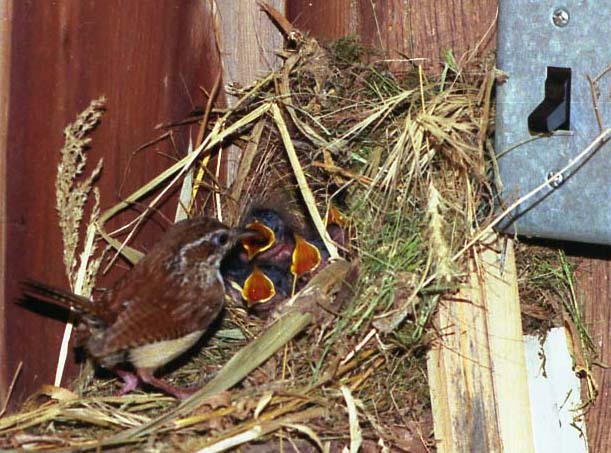 The 2010 nesting also appeared normal, except for very high mortality. Also, the subject of cannibalism arose - specifically what is and what isn't cannibalism in barn owls. I'll leave that for the 2010 barn owl page this winter. Discovering a Carolina wren's nest is always a surprise. They usually have two broods in different buildings or rooms, and usually manage to interfere with my daily activites for the duration of their nesting. This year was no different. But, what a wonderful species! Nothing like their murderous house wren brethern. &COPY; 2011, 2013 American Artifacts and Richard Van Vleck, Taneytown, Maryland.